Try our satisfaction guarantee - compare our phantom quartz prices and our quality. 2.7" x 1.1" x 0.8"
This naturally terminated rock crystal quartz specimen has an easily visible phantom quartz crystal shape within. It has excellent transparency and the natural terminations are in very good condition. This natural rock crystal quartz specimen has easily visible white and green chlorite phantoms within it as shown in the close-up photo at left. There also are some light-purple clay mineral inclusions. The terminations are in good condition overall, and they have vitreous luster. 2.8" x 1.3" x 1.2"
This naturally terminated rock crystal quartz specimen has an easily visible phantom quartz crystal shape within it, and it has very good transparency. 2.8" long x 1.2" x 1.1"
This naturally terminated rock crystal quartz specimen has two easily visible white phantom crystal shapes within it. The rock crystal quartz has superb transparency and is mostly flawless! The terminations show vitreous luster and are in good condition overall. This double-phantom quartz crystal was mined at Mato Verde, Brazil in 1991. 3.8" x 3.6" x 2.8"
This natural rock crystal quartz specimen has an easily visible phantom quartz crystal shape within it. The terminations are in mostly good condition with some small abrasions. This crystal has good transparency, with many beautiful planes and veils within. 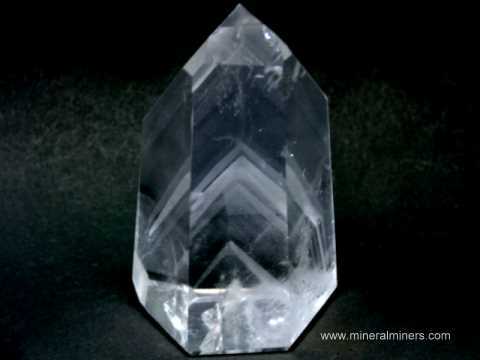 There is a natural triangular marking on one of the terminations that is popularly referred to as a record keeper - see a close-up of this naturally terminated record keeper crystal. Phantom quartz crystal dimensions: 4.1" x 2.7" x 2.3"
This natural rock crystal quartz specimen has easily visible chlorite phantoms within it as shown in the close-up photo at left. There are also several intergrown crystals in this specimen with clay minerals attached to the majority of its surfaces. This phantom quartz crystal specimen has all natural surfaces with some abraded areas and some surfaces with milky quartz coatings. See also a full view photo of this naturally terminated phantom quartz crystal. This genuine phantom crystal stands 1.6" tall x 0.9" x 0.7"
This small polished crystal of natural phantom quartz has very fine transparency with natural multiple phantom crystal shapes inside. This genuine phantom crystal stands 1.7" tall x 0.7" x 0.6"
This small polished crystal of natural phantom quartz has very fine transparency with a natural white phantom crystal shape inside its base. 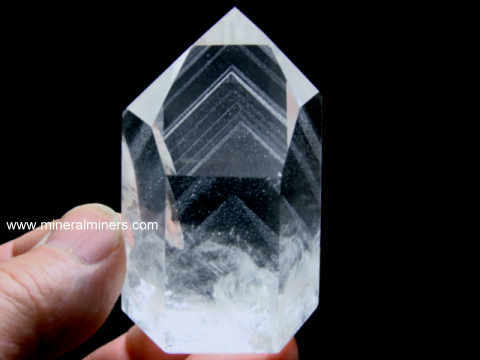 This genuine phantom crystal stands 1.5" tall x 1" x 0.8"
This small polished crystal of natural phantom quartz has very fine near flawless transparency with a natural white phantom crystal shape inside its base. This genuine phantom crystal stands 2.1" tall x 0.8" x 0.4"
This rare quality polished quartz crystal crystal has amazing natural multiple phantom crystal shapes within it. This genuine phantom crystal stands 2.6" tall x 1.4" x 0.9"
This rare quality polished crystal of natural phantom quartz has very good transparency with faint natural phantom crystal shapes inside! This genuine phantom crystal stands 2.3" tall x 1.5" x 1.1"
This polished crystal of natural phantom quartz has very fine transparency with a natural white phantom crystal shape inside at its base. There also is another quartz crystal over one inch long penetrating into one side of this crystal! See a side view showing the crystal penetrating into this natural phantom quartz crystal. This genuine phantom crystal stands 2.8" tall x 1.1" x 1"
This polished crystal of natural phantom quartz has natural multiple phantom crystal shapes inside. See also a side view of this genuine quartz phantom crystal. This genuine phantom crystal stands 2.5" tall x 1.4" x 1.2"
This polished crystal of natural phantom quartz has very good transparency with multiple natural phantom crystal shapes within it. This genuine phantom crystal stands 3.2" tall x 1.3" x 0.8"
This polished crystal of natural phantom quartz has very rare transparency with multiple natural phantom crystal shapes within it. This genuine phantom crystal stands 2.9" tall x 1" x 0.8"
This fine quality polished crystal of natural phantom quartz has very rare transparency with multiple natural phantom crystal shapes within it. This genuine phantom crystal stands 3.2" tall x 1.2" x 1"
This polished crystal of natural phantom quartz has rare transparency with multiple natural phantom crystal shapes within it. This genuine phantom crystal stands 2.7" tall x 1.2" x 1.1"
This polished crystal of natural phantom quartz has very fine transparency with faint natural phantom crystal shapes inside. This genuine phantom crystal stands 2.7" tall x 1.4" x 1"
This polished crystal of natural phantom quartz has very good transparency with multiple natural phantom crystal shapes within it. See also a full view of this rare quality phantom quartz crystal. This genuine phantom crystal stands 2.5" tall x 1.25" x 1"
This rare quality polished crystal of natural phantom quartz has rare transparency with multiple natural phantom crystal shapes within it. See also a close-up view of the base of this genuine quartz phantom crystal. This genuine phantom crystal stands 3" tall x 1.9" x 1.4"
This polished crystal of natural phantom quartz has good transparency with multiple phantom crystal shapes within it. 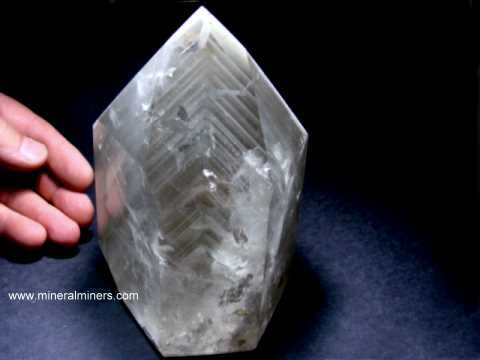 See a side view of this rare quality phantom quartz crystal. See also an opposite side view of this phantom quartz crystal. This polished quartz crystal has very good transparency with a relatively thin flat shape. There are multiple natural phantom quartz crystal shapes within it. See also a full view of this natural phantom quartz crystal. This genuine phantom crystal stands 4" tall x 1.5" wide x 1.1"
This polished quartz crystal has very good transparency with light golden-brown natural color. There are multiple natural phantom quartz crystal shapes within it. See also a different side view of this natural phantom quartz crystal. This genuine phantom crystal stands 4.3" tall x 1.6" wide x 1.2"
This genuine phantom crystal stands 2.8" tall x 2.1" x 1.8"
This polished crystal of natural phantom quartz has good transparency with multiple phantom crystal shapes within it. See also a view of this rare quality phantom quartz crystal from the side, and a similar view of this phantom crystal with different lighting. This genuine phantom crystal stands 4.5" tall x 1.4" wide x 1.2"
This polished quartz crystal has very good transparency with multiple natural phantom quartz crystal shapes within it. See also a different side view of this natural phantom quartz crystal. This genuine phantom crystal stands 4.9" tall x 1.8" x 1.4"
This polished quartz crystal has very fine transparency with natural light brown color at its base grading into colorless towards the tip. This polished quartz crystal has a very strong beautiful rainbow reflection inside its base. It also has faint multiple natural phantom quartz crystal shapes within it! See also a close-up view of the tip of this natural phantom quartz crystal. We also have a handcrafted custom wood base for this quartz phantom crystal that will be included at no extra charge. This polished quartz crystal has rare very fine transparency with natural light brown color at its base grading into colorless quartz towards the tip. There are multiple natural phantom quartz crystal shapes within this polished quartz crystal. See also a full view of this natural quartz crystal phantom. We also have a handcrafted custom wood base for this phantom crystal which will be included at no extra charge. This genuine phantom crystal stands 3.4" tall x 1.8" wide x 1.4"
This polished quartz crystal has very rare transparency with multiple natural phantom quartz crystal shapes within it. This genuine phantom crystal stands 2.8" tall x 2.4" wide x 2"
This polished quartz crystal has very good transparency with multiple natural phantom quartz crystal shapes within it and a colorful rainbow reflection at its base. See also a different side view of this wonderful crystal of genuine phantom quartz. This genuine phantom crystal stands 3.9" tall x 2.4" wide x 1.6"
This polished quartz crystal has very good transparency with multiple natural phantom quartz crystal shapes within it. The photo at left shows this beautiful phantom crystal on a lite box. See also a side view on a light box of this unique crystal of phantom quartz. This genuine phantom crystal stands 4.4" tall x 2.3" x 1.6"
This polished quartz crystal has rare very fine transparency with natural light brown color smoky quartz at its base grading into colorless quartz towards the tip. There are multiple natural phantom quartz crystal shapes within this polished quartz crystal. See also a side view of this natural phantom quartz crystal. We also have a handcrafted custom wood base for this phantom crystal which will be included at no extra charge. See also a view that better shows the fine transparency of this natural phantom quartz crystal. This genuine phantom crystal stands 4" tall x 2.3" wide x 1.9"
This polished quartz crystal has very good transparency with multiple natural phantom quartz crystal shapes within it and a colorful rainbow reflection at its base. See also a side view of this beautiful crystal of genuine phantom quartz. This genuine phantom crystal stands 4.2" tall x 3.7" x 2.6"
This polished quartz crystal has very good transparency with multiple natural phantom quartz crystal shapes within this polished quartz crystal. See also a different side view of this large phantom quartz crystal. 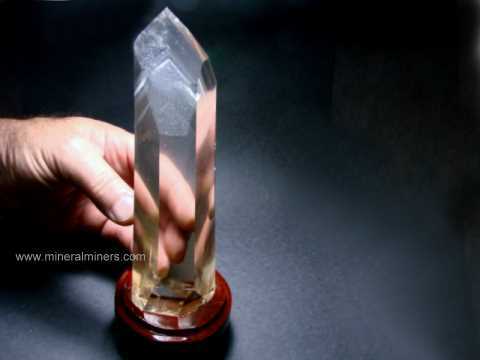 This genuine phantom crystal stands 6.8" tall x 2.2" x 1.7"
This polished quartz crystal has very fine transparency with natural light brown color smoky quartz at its base grading into colorless quartz towards the tip. There are multiple natural phantom quartz crystal shapes within the tip of this polished quartz crystal as shown at left. See a full view of this genuine phantom quartz crystal. We have a handcrafted custom wood base for this phantom crystal which will be included at no extra charge. See also a view showing this phantom quartz crystal in its wood stand. This genuine phantom crystal stands 6" tall x 2.7" x 2.0"
This polished quartz crystal has very good transparency with natural light brown color smoky quartz at its base grading into colorless quartz towards the tip. There are multiple natural phantom quartz crystal shapes within this polished quartz crystal, and some internal rainbow reflections at its base. See also a close-up view showing some of the rainbow reflections in this phantom quartz crystal. We have a handcrafted custom wood base for this phantom crystal which will be included at no extra charge. This genuine phantom crystal stands 8.2" tall x 2.5" x 2"
This polished quartz crystal has very fine transparency with natural light brown color smoky quartz at its base grading into colorless quartz towards the tip. There are multiple natural phantom quartz crystal shapes within this polished quartz crystal. 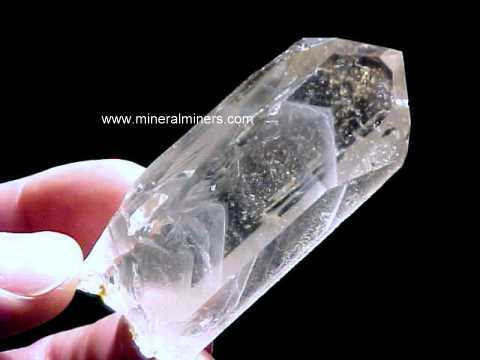 See a full view of this genuine phantom quartz crystal. See also a full view of a different side of this natural phantom quartz crystal. We have a handcrafted custom wood base for this phantom crystal which will be included at no extra charge. See also a view showing this quartz crystal in its wood stand. This genuine phantom crystal stands 5.7" tall x 4.8" x 3.7"
This polished quartz crystal is colorless with some green and brown chlorite inclusions and with multiple natural phantom quartz crystal shapes inside. This unique crystal also looks fantastic on a light box. The photo at left is a close-up of the tip showing some of the green chlorite inclusions. See also a full view of this phantom quartz decorator crystal. All surfaces of this beautiful crystal are polished. The back surfaces show some green and brown chlorite. 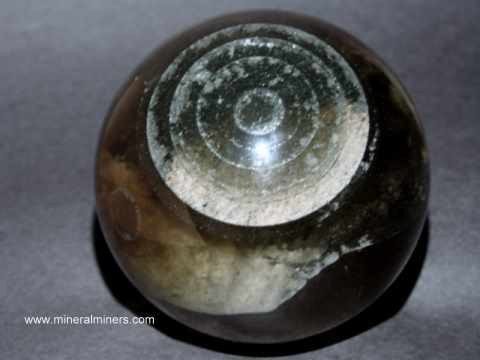 See also a back view of this quartz with chlorite decorator crystal. This genuine phantom crystal stands 6.4" tall x 5" x 3.7"
This polished quartz crystal has more than 50 multiple natural phantom quartz crystal shapes inside! This crystal looks fantastic on a light box - see a photo of this phantom quartz decorator crystal on a light box. All surfaces of this beautiful crystal are polished. The back surfaces are covered with a thin layer of milky quartz phantom layers. The front surfaces allow you to see into the crystal as shown. See also a back view of this genuine phantom quartz decorator crystal. This genuine phantom crystal stands 7" tall x 4.8" x 3.1"
This polished quartz crystal is transparent with a large rainbow reflection inside and with multiple natural phantom quartz crystal shapes inside. This unique crystal looks fantastic on a light box. See also a side view of this unique phantom quartz decorator crystal. All surfaces of this beautiful crystal are polished. See also a back view of this decorator quartz crystal. Our Phantom Quartz Mineral Specimens are 100% Natural! To see more phantom quartz photos, just select another item category from the table below. See also our selection of genuine quartz crystals and naturally terminated quartz crystal mineral specimens. To see photos of another mineral variety, select any item category link in our Mineral Inventory & Factsheet Index. You can also see a variety of genuine handcrafted quartz crystal carvings including quartz crystal frog carvings, quartz crystal turtle carvings and quartz crystal angel carvings. We have additional inventory of natural phantom-quartz crystal products, so be sure to let us know if you have any quartz phantom requests. Each of our quartz crystal phantoms is natural quartz crystal. We specialize in Collector Quality Phantom Quartz Crystals! Information about genuine quartz crystal phantoms and their history, physical properties, chemistry, occurance, and metaphysical uses is displayed on our phantom quartz information page. Would you like us to inform you when we add on this page more natural phantom quartz mineral specimens? We have over 150 tons of gem & mineral items in stock at our mineral warehouses, so be sure to let us know if you have any requests for natural phantom quartz mineral specimens.